Some kind of disease have to care about thoroughly. Diabetes is one of such disease. If your do not control correctly it will expose many complications and therefore it will challenge your life. If you have such disease you will be recommended by doctors to do HBA1c testing. This is a blood test which tests the blood sugar level. To test the blood sugar level, most of the time use the FBS (Fasting Blood Sugar). To do this test, patient have to stay 8-10 hours without eating or drinking. And it is important to check the blood sugar level after 2 hours of taking meals. It is called Postprandial Blood Sugar (PPBS) test. Anyway the FBS should be less than 130 and PPBS should be less than 180. But the values are subjected to change occasionally. This depends on what you eat and the level of exercise you get. If you test FBS in two adjacent days it may change with a value of 30-40%. Therefore the above tests will not accurate all the time. Because of this doctors prescribe to do HBA1c testing. 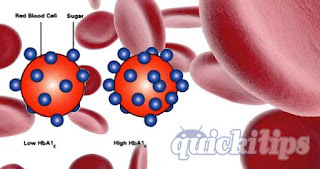 We can get and idea of blood glucose of past 3 months from the HBA1c. HBA1c is testing the glucose stored in red blood cells. Red blood cell has 120 days life and we can get an idea of glucose level of blood within 120 days. The value of this test is 4.5-5.5% in a healthy person. If this level is between 5.7-6.4% it is a pre-diabetic condition. If it is greater than 6.4% we can call him a diabetic person. When controlling the diabetes this level should be controlled under 7%. But in some cases the doctor can recommend a value more than 7%. HBA1c is a very sensitive test and should be done within a quality laboratory conditions. If it is not, the levels may wrong and doctors could not predict the exact condition. This test should be done twice a year. If diabetes has not controlled well this should be done once in three months.